Jerusalem is a stunning city. When the sun hits this city of stone, it sparkles. But the New Jerusalem that John saw in his vision sparkled even more. John utilized vivid language to describe what he saw. Much of this may be literally what John saw. But because John had never seen anything like this, some of it may be the best he can do with figures of speech. Metaphors and symbols are embraced when normal language just does not cut it. John was mesmerized by this holy city that came down out of Heaven. He obeyed the voice of one of the seven angels (Revelation 15:1), finding himself in the Spirit (a visionary inspiration), and even went to a mountain great and high (see also Isaiah 2:2, 3) to view this wonderful wife of the lamb. A different metaphorical woman in the book of Revelation is a prostitute who is filled with abominations, has terrible names written on her, and is called Babylon (Revelation 17). This metaphorical woman is a wife filled with transparency, who has the seal of God on her and is called Jerusalem. Her beauty takes one’s breath away. But this wife is not just a wife; she is a city. John described her beauty in highly figurative and symbolic terms. John’s attention was drawn to the city’s glory, walls, gates, and foundations. The glory of the city is described in terms of shining brilliance and security. It was like that of a precious jewel, like a jasper, clear as crystal. Jasper was a well-known jewel in the ancient world. Jasper is not clear, but the phrase clear as crystal is descriptive of beauty. It shines. 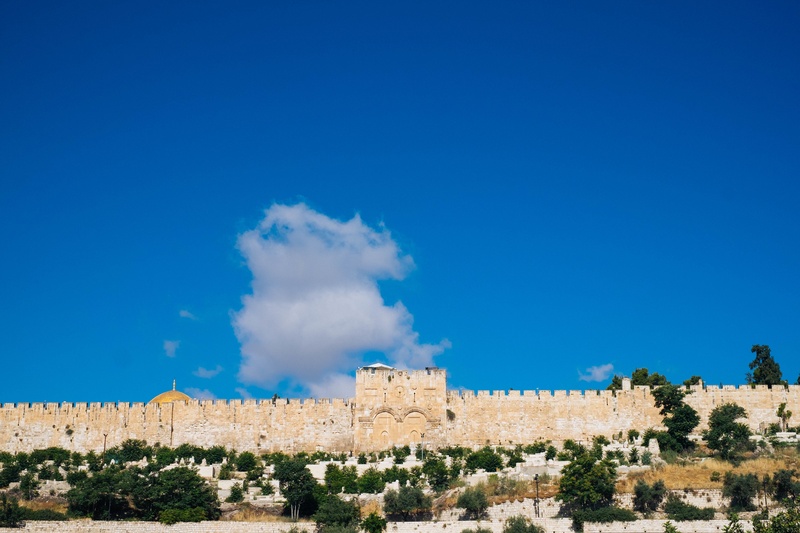 The walls of the city are high, which symbolize protection. The unprinted part of our text indicates that the wall’s thickness is about 72 yards (Revelation 21:17), also representing safety. The glory of the city is described in terms of majesty and symmetry. This text is brought to you by the number 12 (we see 12 gates, 12 angels at those gates, 12 names of the tribes of Israel on the gates, and 12 foundations). Obviously the number 12 is a significant symbolic number. The Old Israel and the New Israel account for the number 12 (a complete picture of God’s people). This city has perfect symmetry too. Just like Israel camped around the tabernacle (Numbers 2:1-34), so the people of God surround the throne in the New Jerusalem. In fact, the city is a perfect cube (Revelation 21:16). Think of the volume of this in a literal way. The space shuttle circles the earth at about 300 miles above the earth. The city goes out into outer space about 1,400 miles. That’s big. The most important part of Old Jerusalem was the temple. So John looks inside the city to find the temple. To his surprise he finds none. Neither does he find a light. But he does find the Lamb. An engaging part of biblical cosmology is that light existed before sun, moon, and stars (Genesis 1:3-5, 14-19). Also after the sun is extinguished, light will still exist (Revelation 22:5). The most important part of this city is the Lamb himself. God had always planned for humankind to multiply and fill the earth (Genesis 1:28). In fact, he got frustrated when people pushed against that plan (11:4). So we should not be surprised when many nations will walk by the light provided by this wonderful Lamb. This New Jerusalem is described even more in terms of its number, security, and its purity. The New Jerusalem will be filled with people (Revelation 7:9). In fact the kings of the earth will bring their splendor into it. The imagery here is that of a conquering king parading his POWs and spoils into his city after winning a battle. City gates were very significant in the ancient world. No one in their right mind would leave them open. That would mean too much vulnerability. But the Lamb temple is so sovereign he can risk it. God’s people are secure. There is also no night there. This probably has a moral nuance to it (John 13:30). All of the evil has been defeated. Nothing impure will ever enter it and anything shameful and deceptive does not stand a chance. This New Jerusalem is all about the Lamb and his flock.